VANCOUVER, BC / ACCESSWIRE / January 10, 2019 / Searchlight Resources Inc. ("Searchlight" or the "Company") (TSX-V: SRCH) is pleased to announce the results of the October 2018 prospecting on the 100% owned Cameron Cobalt Project located in Brigstocke Township approximately 20 kilometers southwest of the town of Cobalt, Ontario and 120 kilometers north of North Bay, Ontario. 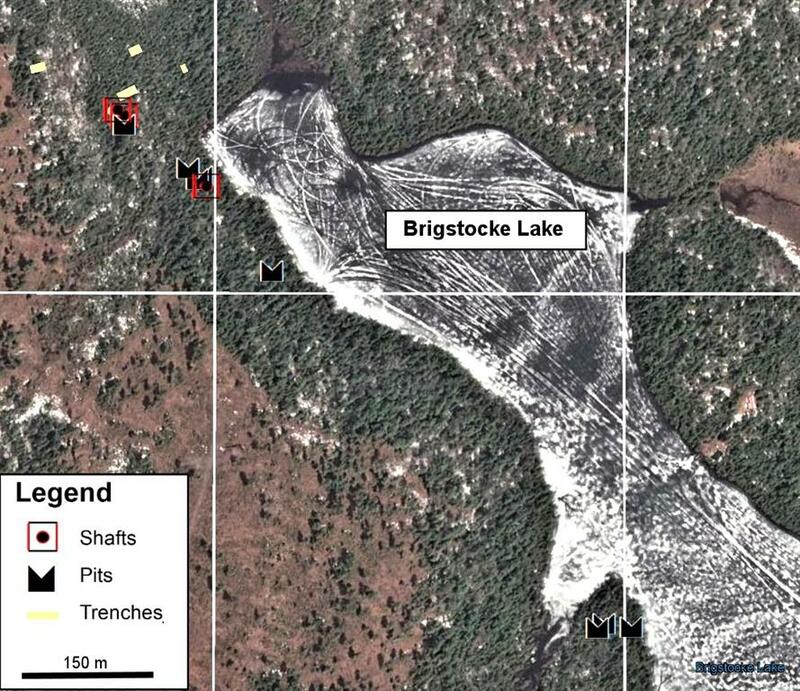 In October 2018 a team of prospectors spent 4 days prospecting and sampling the 100% owned Cameron cobalt target area at the north end of Brigstocke Lake. The team located and mapped the locations of 3 historic shafts, 4 pits and 7 trenches, with waste dumps near the workings. The area was largely over grown, and it is likely more features exist. See map 1 below. A total of 40 grab samples were collected from the area, the majority from waste dumps and outcrop exposed in shafts and pits. The results included a number of anomalous samples with selected samples shown in the table 1 below. The results include 1.35% Co in sample R318936 and 0.63% Co, 0.864% Ni, 341 ppb Au and >2,000 ppm Bi in sample R318939. "The Searchlight team is encouraged by these high-grade cobalt results, it is always gratifying to take a 100% owned grass roots project and quickly add value with high grade results. We are now looking forward to following up as soon as the snow is gone. ", notes Stephen Wallace, CEO and President of Searchlight. Mr. Wallace, further stated "These results reinforce the value of Searchlight's philosophy of having quality early stage projects as part of the company's portfolio and the Company will continue to seek out this style of projects." 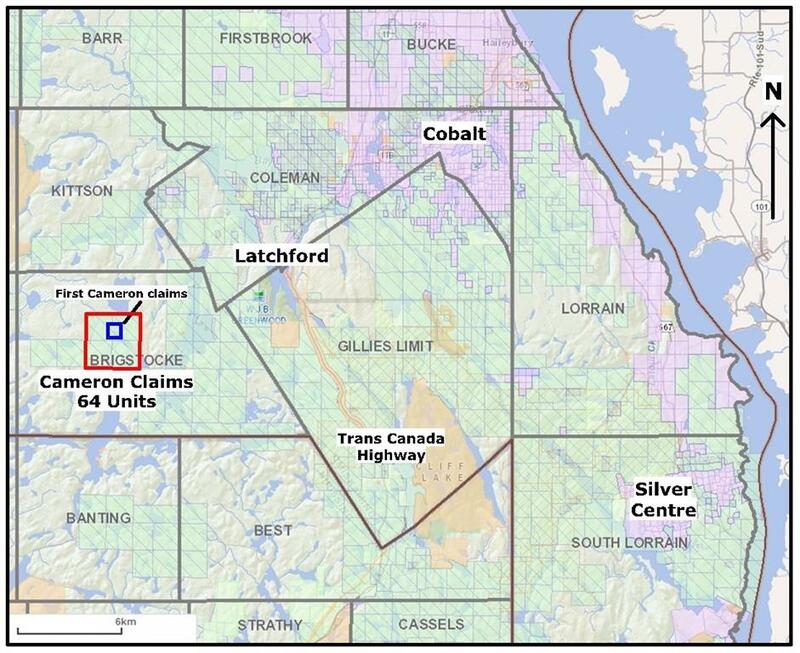 The Cameron claim block consists of 64 claim units covering an area of 1,024 hectares in Brigstocke Township approximately 20 kilometers southwest of Cobalt, Ontario and 120 kilometers north of North Bay, Ontario. See Map 2 below. The claims are 100% owned by Searchlight with no royalties. The Cameron claims cover the past exploration pits and shafts of the Cameron target developed in the 1950's which is now closed. A grab sample collected in 1987 from the historical Cameron pits and analyzed by the Ontario Geological Survey returned assay values of 2.26% Co and 1.7 g/t Au. (Data Source is file MDI31M05SW00021 from the Ontario Mineral Deposit Inventory). Geologically the Cameron Cobalt property is located within the Cobalt Embayment in the Southern Province of the Canadian Shield where Huronian Supergroup sedimentary rocks lay unconformably overly Archean basement rocks. Both the Huronian sediments and Archean rocks have been intruded by Proterozoic-aged Nipissing diabase occurring as both sills and dykes. The Cameron property claims covers the contact between the Proterzoic sediments of the Lorrain and Gowganda formation of the Huronian Supergroup and the intrusion of the Nipissing Diabase. The mineralization model for the property is the "Five Element Vein" style of mineralization (Co-Ag-Ni-Bi-As), which is characteristically found with 250m of the diabase contact. This is the characteristic cobalt silver mineralization found throughout the Cobalt and Silver Centre mining camps. Stephen Wallace, P.Geo., is Searchlight's Qualified Person within the meaning of National Instrument 43-101 and has reviewed and approved the technical information contained in this news release. Searchlight Resources Inc.("Searchlight" or the "Company") is a mineral exploration and development company listed on the Toronto Venture Exchange (TSXV). The company is active with mineral exploration projects in Saskatchewan, Ontario and Nevada, three of the top seven jurisdictions in the world for mining investment as ranked by the Fraser Institute. The Company holds a portfolio of gold, cobalt and base metal projects from grassroots stage to advanced exploration and NI43-101 resource development. The Bootleg Lake project is 16,900 hectares of claims in Saskatchewan covering prospective areas of the Flin Flon Greenstone belt. Exploration is being carried out at the past producing Newcor, Rio (Bootleg) and Henning Maloney Gold mines located approximately 5 kilometres from Creighton Saskatchewan and about 7 kilometres from the Hudbay 777 mine located in Flin Flon, Manitoba. In addition, the Bootleg Lake claims hold Volcanogenic Massive Sulphide (VMS) base metal potential with claims adjacent to the Hudbay Mines claims hosting the producing 777 base metal and gold mine in Flin Flon and the four past producing base metal mines, Flexar, Birch Lake, Amisk and Coronation. 1) The Munro Warden project is an early stage exploration prospect targeting VMS copper, nickel and cobalt within the Kidd- Munro assemblage of the Abitibi Greenstone Belt. The project covers 1,100 hectares including 9 mining lease and 11 claims blocks located approximately 90 kilometres east of Timmins, Ontario. Searchlight's Nevada project New York Canyon hosts two copper deposits in the Walker Lane Structural Belt located in western Nevada. The Long Shot Ridge skarn deposit with a 2010 NI43-101 resource estimate and the Copper Queen porphyry deposit drilled out by Conco in the 1970's. Early Warning Press Release Regarding Investment in Searchlight Resources Inc.